The rapid development ages entered the kingdom once that was lying under the loom of shadowed isolation and untreated poverty, ever since then. The stretched cloud of ignorance and the unlighted gloom of illiteracy were soon removed and the new aged life that which happens around the world with other human beings touched the lives of Bhutanese that today the world look on us as not only the people of last shangrila but also as the people from a country which develops faster in any terms of development in the world. There are crises of everything happening at the expense of human lives, and nothing can be done to put the cease to the problems ranging from small dispute between two ideologists to the world wars, and amidst of all these worldly lackadaisical nuisance, we are safe and safe in the vision of our lords and least seen is negligence of our prayers. The entry to United nation in 1972 by the great monarch or a better known as a Father of Modern Bhutan marked the tremendous and jubilant commencement of everything that the fourth monarch has dreamt to achieve and, and the achievement towards the glory of Gross National Happiness truly would bestow upon the glory of kingdom with the new generation king, the fifth monarch Jigme Khesar Namgyal Wangchuk. The prayers of thousand souls and a noble king, the fourth druk gyalpo were answered when a truly young prince was born on the glorious occasion, 21st Feb, 1980. As if to fulfill the wish of people and to lead their kingdom of thunder dragon towards the never-ending glory, young prince truly was a blessing. And undoubtedly, today the Bhutan is better known through him and his great fathers. The young prince truly was brought up under the nobly education and had passed from institution like Oxford, and today if any journalist, in fact international, could write and praise anything more about the youngest ruler of the world, then it’s the statement that which will read:….Bhutan’s king charming is an Oxford man and a king who truly believed in the democracy, that the lord he himself encouraged the people to take a enthusiasm in sharing a power and freedom to build the Bhutan as an epitome of glory and exemplified new generation democracy. 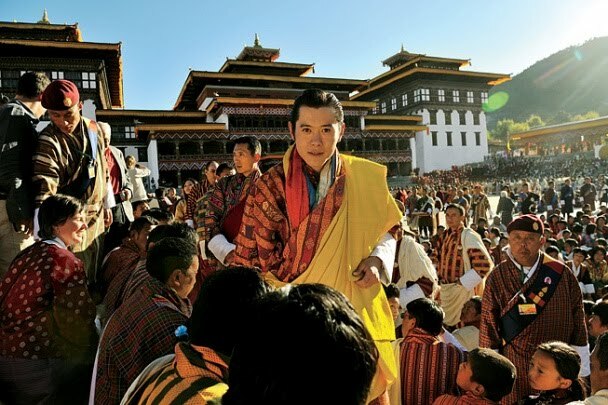 It’s been hundred years since Bhutan had witnessed that historic moment in the annals of history and sooner we are to expect another such memorable hour with the greatest jubilations of crowning the fifth sovereign. The songs would be sung in the honor of the king’s glorious reign and his glorious reign over the loyal citizens of the country would embark upon, the flags would be fluttered to mark the greatest oath of independency Bhutan would enjoy under his benevolent leadership, and finally prayers would be chanted for the long life and the greatest victory from all the evils and crises. Infact there was never a time where Bhutanese failed to pay utmost prayer to the kings and indeed there was never a time when our kings failed to radiate the light of loving kindness to the people of Bhutan. They were there in the times of crisis and undoubtedly they had stood to militate against external warfare besides endeavoring with envisioned thought to bring about happier web of human environment, and this was how the great Monarch the fourth Druk Gyalpo introduced the concept of Gross National Happiness which not only was triumphant among the Bhutanese but was ushered with warm embrace even from countries like England and many other countries. Today we are known as a mother of GNH, and truly, our king a not less than the greatest leader ever lived. Similarly the other great kings had also served their best to best meet the time and call of duty with voice of clear and farsighted conscience. The year 2008 is no different from the century before; we are given a huge and priceless opportunity to think about our country before 100 years and pay ever paid homage to the kings and also to pray and wish for yet many other similar times in future under the benevolent leadership of king Jigme Khesar Namgyel Wangchuk. Of course the king had several times displayed his unrivaled versatilities through his sterling eloquences and portrayal of selfless involvements; it will offer us to wish for more embodiments of great virtues. Let’s wish something more than highest morality, deepest concern, and penetrative wisdom- qualities unsurpassed and unparalleled in human history. Thus we can proudly tell the world that here lives the great Monarch. The democratic leaders and their constitutionalised government has marked the year with yet another ornamental quality and the history would remember the young king and his kingship as more better than one great ruler. The democracy ushered with warm embrace by the king would now bow down before the father of democracy to exhibit his own ideology of sharing of power and right of humankind. It does makes sense to show the utmost respect and the utmost homage to the fathers of nation who have build but a peaceful and a self reliant kingdom over the ages. The centenary celebration and the coronation of the fifth monarch would definitely invite thousands of blessings and a great moment to cherish. It would stay within the every Bhutanese as a piece of wonderful memory where they had but wished the everlasting happiness and tranquil in the kingdom. The rays of hope and the waves of loyalty among the citizens, and of course the noble thought of people to crown the king with huge celebration was enough for king( as spoke in national assembly, 87) and the spoke of king’s noble wheel of generosity and wisdom disclosed an unequaled heavenly concern for his people and the country. Yet still we feel the nation’s greatest pride of loyalty and respect lies in celebrating unprecedented event gloriously but honestly and avidly. It will compile the gorgeous package of nation’s pride. Let’s wish devotedly for the event and anticipate for the greatest moment whereby we create a momentum of bliss bestowing us with yet another great king. The celebration of coronation and centenary would not only be marked with the students singing national songs, offices remaining closed, people portraying the beautiful slogans expressing their heartfelt prayer for prosperous reign of Druk Gyalpo, but it would mean a blessing for many to gather in the celebrating platforms and cling to the eternal bliss under the finest, noblest, and undying service of the king which would be genuine both in words and spirit. People gathering in the ground should display the great pyramid of unity and must revive the less happy souls. As the crown ascends on the new king the ray of new hope and new landscape of expectation should sprung in every Bhutanese and let the world know that this is the uncommonness we had from rest of the world. The tree of expectation and stream of prayer must enshrine the noble young king to reach everyone’s horizon of undying need, and response to the nation’s irrevocable call. Thus I sincerely feel that the crown awaits the king. I am indebted, and thus from the deepest corner of my heart, let me chant the prayers for the noble kingship of noble one adding to the many offered by the loving citizens for the reign that would go on to bring a tons happiness and a billions peace which would live beyond memory and live more longer than eternity. Well whoever comes across this article, I would like to make onething clear. This article was written long back before the coronation of fifth Dragon Monarch, so it doesn’t really speak anything about his majesty’s gracious acts of rule which continues to make every Bhutanese blessed.